My first Stampede happened to be the centennial. To put Stampede into perspective for Torontonians, I’ll loosely describe it as an inflated CNE gone Western peppered with rodeos tossed with a ton of drunken tourists believing they are from the wild West. Stampede is a 10-day long event that reminded me so much of T.O with all the crowds, noise & late-night trotting hooligans scattered throughout the streets. July 6th marked the first day of Stampede that kicked off with a parade right along my street (that’s downtown livin’ for ya). The set up began as early as 7am. That morning the YEE-HAWing cowboys beat my alarm clock to the wake-up call. Bleachers lined the street’s sidewalks but it wasn’t enough to seat the crowd. The night before, eager parade fanatics tied down their fold out chairs to street signposts to make sure they’d have the front row seat. I only got see the pre-show since I had to make my way to work. To celebrate the start of Stampede, I had breakfast on my balcony with an aerial view of the parade. I savoured my Habanero Sea Salt milk chocolate bar that Bernard Callebaut Chocolaterie featured for the festivity with my cup of joe while I watched the sea of cowboy hats dance away. Then I slowly made my way to work. I dosey-doed with a cowboy while trying to cross the street. If that happened every day, I wouldn’t need the caffeine. Overall, it was wonderful to get a glimpse of a festival that is authentically Canadian. From watching the calf roping and chuck wagon racing to visiting the Native Village, the festival highlighted its history with the present multicultural audience showing the new face of Canada. Despite the criticisms the Stampede receives, it seems that people are forgetting how things in Canada once were. That’s why once a year, there is the Stampede working as a reminder of what a Canadian festival was and what it will continue to be–except with a lot more scandalously clad cowgirls. 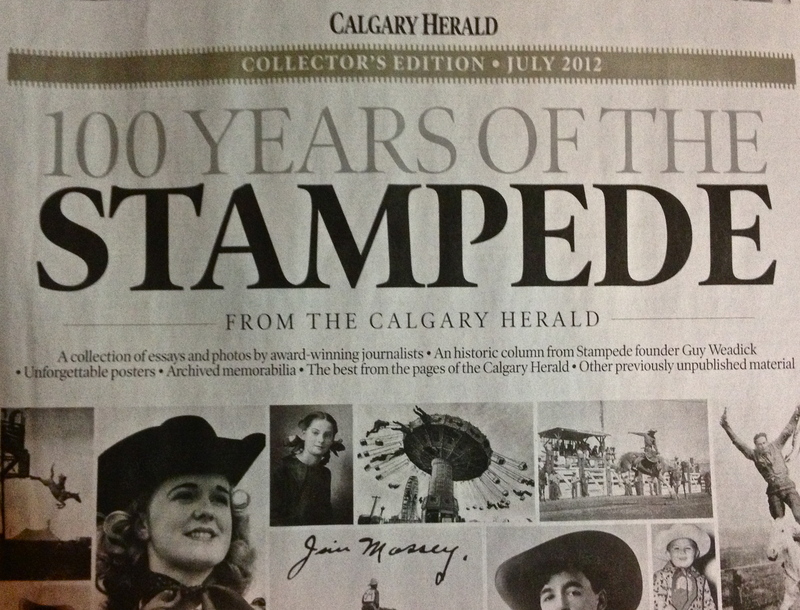 Tags: 100 Years, Calgary, Canada, Celebration, Centennial, Cowboys, Stampede, YYZ. Bookmark the permalink.